For my daughter's 5th birthday we had a fun and educational butterfly party. The party was inspired by a workshop we attended at our local Science Center where we learned about butterflies and were given a REAL live caterpillar to take home and watch hatch into a butterfly. My daughter loved her pet. The activities for the party were based around the life cycle of the butterfly. INVITES: My daughter colored a picture of a butterfly which I scanned and printed on homemade invites. 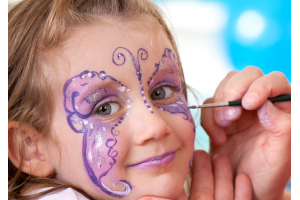 We wrote: Flutter on over to Elizabeth's 5th birthday". CRAFTS: When each child arrived we gave them dress-up wings (purchased at the dollar store) to decorate with foam stickers and their name. Next children wore their wings to have a scavenger hunt. STORIES: After the scavenger hunt my husband read the kids The Hungry Caterpillar while I got lunch ready. FOOD: We served lunch inspired by the butterfly life cycle. The buffet was set up with all the food and homemade placetags made by my daughter. The food included: Butterflies (a beautiful rainbow striped Italian bow tie pasta) eggs (peas) chrysasis (rainbow Italian cone shaped pasta) caterpillars (olives lined up on toothpicks) butterfly food (spinach salad and cheese cubes). CUPCAKES: cupcakes with bright colored butterflies on top. Each cupcake had two fruit slices cut in half and arranged on top. In the middle was a bright gummy worm slices of spice drops on the fruit slices and two small bits of red string licorice as antenna. The cupcakes were colorful and adorable! FUN FAVORS: In addition to the items each child gathered during the scavenger hunt and their wings we made butterfly houses (plastic bowls from a party supply store with holes punched in the top) and gave each child 2 live caterpillars in vials with food to take home. We ordered a classroom caterpillar kit from sciencekit.com. We got great feedback from parents and kids on this unique party favor. The families and kids kept in touch the caterpillars grew and turned into butterflies. Some of the families got together in the park for a butterfly release. DECORATIONS: I ordered classroom scientific butterfly cutouts (from christianbook.com) which we hung around the house and dining room chandelier where we had lunch. We got great huge butterfly balloons from a party supply store which we had at our front door. Bright happy birthday butterfly paper products were purchased at the dollar store. PHOTOGRAPHER: I close friend who is a professional photographer came to the party and took fantastic pictures of the kids. The photographer was fabulous so I could enjoy the party without taking pictures. I would highly recommend a butterfly party!"